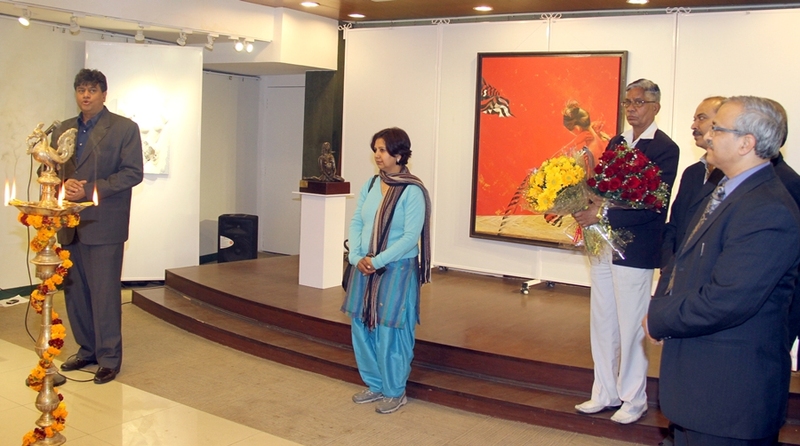 Delhi is hosting a unique SOLO SHOW of PAINTINGS and SCULPTURES by renowned Painter and Sculptor Renuka Sondhi Gulati. It was inaugurated by Sh Suresh K. Goel IFS, Director General, Indian Council for Cultural Relations who is a seasoned diplomat having held diplomatic positions in Indian Missions in Singapore, Malaysia, China, Egypt and South Africa.He was accompanied by the Dy Director General Shri Anwar Haleemanother seasoned personality who lit the lamp. During discussions they noted that role of ICCR is to promote the Original work of by Creative Artists of India like Renuka Sondhi, who sasy that Art is her Life.Ever since Renuka started knowing about life, she has wanted to be an Artist. She did a lot of Artwork in her college taking part in all possible competitions and never returning empty handed. After an early marriage and family responsibilities, she started spreading her ‘Heart of Art’ by inspiring children in schools. Her students have been winning all possible prizes at various levels.Her works (Paintings and Sculptures) won a prize at the International Art Biennale at Malta ,2011. Her creations have been selected by AIFACS every year since 2007 and has won over a dozen awards/recognitions at various levels so far.She has had 6 Solo and 26 Group Shows besides 5 Workshops/Camps. She creates sculptures in Clay, fiberglass and bronze and paintings in Water Colours, Oil and Acrylic on Canvas on Paper and various other media. She likes to experiment with different materials and textures as she explores abstract and contemporary styles. The context of her work keeps changing, but her main inspiration is female forms as “They are important in maintaining the balance… environmental, social or emotional”. She says: “I want to dissolve myself and what shall remain will be just my works..as an extension of my self”. She use less colours in the pallet and her work shows transparency as well as opaqueness in her work. She uses metallic colours for giving textures and bringing grace in her paintings. Her sculptures come alive with emotions and make the best of aesthetic freedom”. 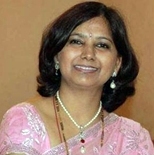 Her works are in display at private galleries such as Novica Galleries ( Associates of National Geographic) and Burland Galleries besides private collections at Paris, Geneve, Zurich, Bonn , Berlin, Malta, Orlando, San Francisco, California, Mexico, Cairo, Johannesburg, Beijing, New Delhi, Mumbai, Kolkata, Bangalore and Hyderabad.Renuka is also active with the NGO AAPSI which is engaged in Care of Elderly, saving the girl child, water conservation, elimination of congress grass etc. Being a woman, she understands the contribution a female makes to the world & that is what she expresses in an artistic way, unique in style. Once again, the physical world and its varied physiognomy engage her sense of rhythm.